Bumper pool tables offer all of the excitement and competitiveness of full size pool tables while using just half the space! 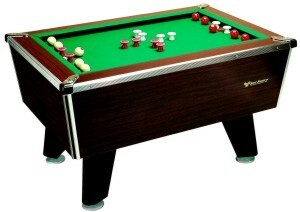 Available in variety of sizes and shapes bumper pool tables can easily fit into any home. 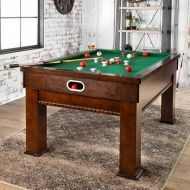 For those who have always wanted a game table at home, but who don't want dedicate an entire room to a standard table, bumper pool tables are perfect for you. Although some bumper pool tables have 14 or 16 bumpers, standard tables come with 12 bumpers. At www.bumper-pool-tables.com we've tried them all and are happy to help you discover which one is right for you. Its not just the size of the table that makes traditional pool table inconvenient, its the size of the sticks too! Not only is the footprint of tournament bumper pool tables less than half the size of full size pool tables but the sticks are smaller so you don't need tons of room around them to comfortably play. Even the smallest pool tables are 6'x 3'. 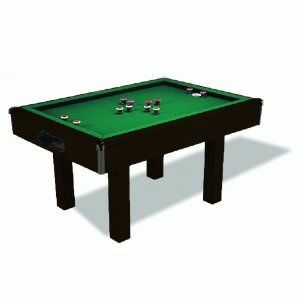 Compare with only 4' x 2 1/2' for regulation bumper pool table and its easy to see why bumper pool tables are the game table of choice for modern homes. You can even cover the table with plywood and a table cloth and slide it away or use it as buffet table when not playing and having fun! 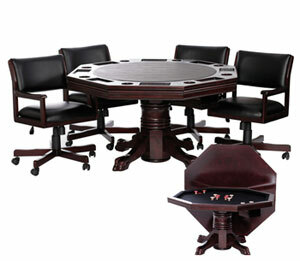 We carry selected combination game tables. The combination game tables are cost effective because they offer several games in one. Our combination game tables are small so it can be placed in any room. There are basically 2 types of bumper pool tables. One is regular rectangle shape and the other is octagon shape. Octagon bumper pool tables offer greater challenge because you have 8 rails to bank off of instead of just 4. 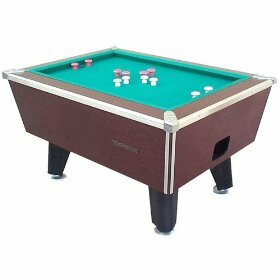 You will also find that octagon shaped bumper pool tables usually are engineered as a multi game table so you can use it as a poker table and even dining table too! Great News! We now carry selected coin operated game tables. 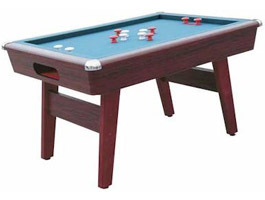 The coin operated game tables are great asset to the recreation room, bars and dorms. Coin operated game tables are the best way to make easy money fast and keep customers coming back for more.